They prefer to keep things spicy by keeping them simple. Their natural Cinnamon chewing gum is the best choice for chewers who love spice and hate synthetics. Unlike conventional gum, which contains hidden plastic and artificial ingredients, they only use natural ingredients, which are crafted into the highest quality gum on the market. And because they don't use plastic, their gum is not only better for your body, it's also biodegradable and better for the planet. 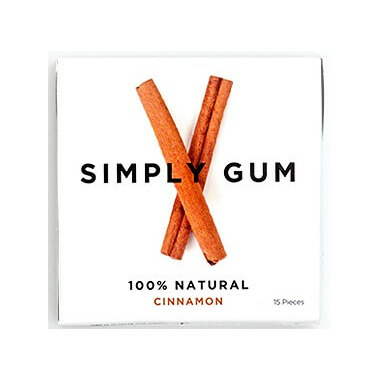 Simply Gum line taste fantastic, cinnamon is my favourite. Packaging is on point. Great job! Delicious, the flavour is natural, it really doesn't compare to the usual cinnamon gums. It also isn't "hot" which I really appreciate. Good flavour and lasts much longer than others - only comment is when disposing its very sticky.